This flavorful Pudina chutney makes a fingerlicking yummy side dish for South Indian breakfasts like idli, dosa, pongal, vada, upma, kichdi, etc. Also it makes a delicious tangy dip for samosa, pakora, masala vada, etc. We know mint leaves are loaded with nutritional benefits. It acts as a great appetizer and promotes digestion. It also helps to releive stomach aches in case of digestion. 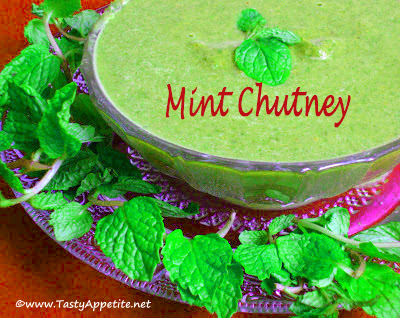 This popular chutney is prepared with mint leaves and grounded with coconut to smooth paste. Check out this easy video recipe to make south Indian style pudina chutney at your home! Roast until light brown and crispy. Drain and take it aside. In the same pan, add grated ginger and toss good. Add green chilli and sliced mint leaves. Toss until the leaves shrinks. Add tamarind, hing and salt. Add 1/4 cup of water and allow to cook for a minute. Meanwhile grate coconut to fine pieces. Add to blender and grind to shreds. Add roasted dals (step 4) and grind to coarse mixture. Transfer the chutney to bowl. Flavorful delicious pudina chutney is ready. Allow to splutter and turn off flame. Pour the seasonings over chutney and mix. This healthy chutney makes a perfect accompaniment with idli, dosa, etc.